and, that your hard work was worth it. Then look at where you planted too much, or too little… don’t judge, just make a few mental notes… then close your eyes, smile and take a wee nap (or a wee nip, or both). This is a good time to test your soil… (check out some dirty little secrets about soil here)...it is often dryer, the labs are less busy and you still have time to amend the soil if needed. It is always a good idea to add compost on top of your garden. The fall rains, and snow will let it sink into the earth. If you have beds that winter with no plants, such as vegetable beds, you should consider covering the soil with more compost and mulch. Tilling will disturb the life cycle of some insects and it will also expose any grubs etc and leave them in the open for birds. Just beware, that turning the soil over can also also disturb dormant weed seeds and allow them to spread throughout your garden. In large areas, tilling can also leave the soil open to erosion if the winds are strong and there is little protection. So if you feel you need to till, decide why you are tilling, (turning over the soil) and make sure it is the best option for your garden. Fall is one of the best times to add compost to the bare soil and then mulch. The soil gives off Nitrogen which the mulch uses for decay.... the circular process that makes living soil and protects beneficial microbes: so essential for plant nutrients. Some tidying means just a bit of pruning- and yes, you can prune your perennials..
Clean up any plants that are decaying, (read slimy) such as Hosta or daylilies- there is less chance of that slippery mess making a winter home for slugs and other nasties to hide out as well as a place for any disease to grow. If you have any diseased plants or leaves, do not put them on your compost as will only spread it. Put them out with your trash. Cut off Peony leaves and if they have white powdery mildew, do not put them on your compost pile either. The same goes for any other plant with mildew, such as Phlox. This is the time to put all your tools in one place. If you have misplaced any, replace them with new ones. Most shops will close for winter and are glad to put them on sale. If you have trouble with wandering tools, my dad had the best solution: paint all your wood handled tools a bright colour. His were red; and there was never any confusion about ownership. Clean each one, removing dirt and any rust; oil them - mineral oil works well- and put them away where you will easily find them in the Spring. (You might have to make a note in your garden journal where that is, because where you think is a good place now, may, in the Spring elude you.... I know from experience. You can disinfect a tool with 1 part chlorine bleach to 9 parts water. Make sure all your tools are dry before storing them. This summer, I found the disinfectant wipes that come in a dispenser, handy to clean my tools when I was finished. I am not sure they were totally disinfected, but at least it was better until I could use the solution above. Sharpen each cutting edge; clippers, pruners, lawn mower blades. Drain all hoses, nozzles, wands and sprinklers before the frost. Turn off outdoor taps from inside and drain them too. On a sunny afternoon, pull out your wheelbarrow, and fill it full of warm water and soap. Empty all pots of earth on a tarp and use it to hill up your roses, or put on your compost pile. Wipe the pots out and rinse them with fresh water. Leave them to dry in the sun before putting them away. Put newspaper between them if you stack them so they won’t stick together and crack. This way, they are clean and ready to go when you get that overwhelming urge to plant in the earliest Spring days. Drain all gas from your mowers, and cutters etc. If water condenses n the tank or thickens, it will make starting them either difficult or impossible next Spring. Some folks even suggest taking out the spark plugs. Store all so they remain dry. It is a good time to make that list of things you will need by Spring. In fact, pick some of these things up now, so when the new garden season arrives, you won't be dashing around instead of digging in the garden - and you won’t have lost your list or forgotten what you need. Bring all your cement ornaments, statues etc in out of the rain, snow and ice. If there is one small crack, water will find its way in and freeze there, pushing them apart into pieces. If you cannot bring them in, cover them to keep them as dry as possible. Clean your barbecue grill - ready for those balmy winter days when it seems like a good day to cook outdoors. Besides, then it will be ready for Spring…. No rust, no goo and no grisley bits for raccoons or skunks to find and snack on. Clean out your bird houses. Wrens especially, will not build in dirty houses… neither would we !. Clean them, store them and put a note on your calendar to put them up the end of February. Clean bird baths and feeders too. 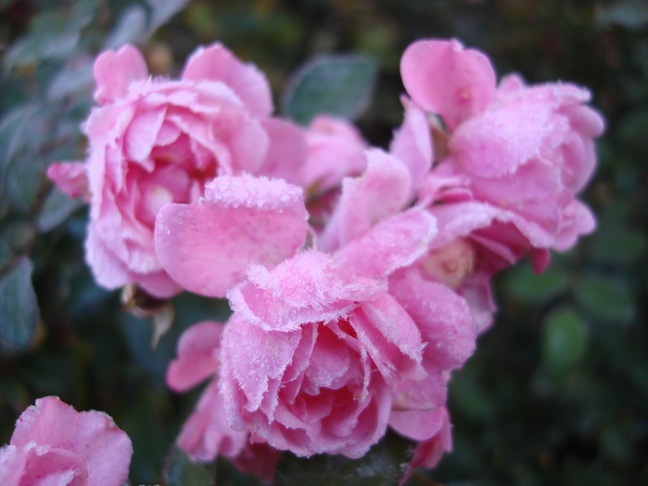 Pull all annual flowers when they have been hit by frost and turn slimy. If you leave them in the garden, they may harbour disease or bugs that you don’t want and their slithery bits will make it hard for you to amend your soil, readying it for Spring. Some annuals will self sow and if this is fine with you, then don’t pull them until the seeds have fallen. However, if you do not want them randomly spread through your garden, cut them back before they seed, or pull them late in the season. All this season’s plants should be pulled. If there is any sign of disease or blight, or even it they have lots of seeds, such as cucumbers, tomatoes, pumpkins etc and they should be thrown in the trash and not the compost. If you have a large garden you could leave some plants in the ground that give some shelter or food for wildlife. However, in the city, this may not be so desirable. Add lots of compost to your soil and even if you feel that more soil is needed, you will still have to put in more compost. Save your leaves, mulch them and put them on top of the bed as well your grass clippings. Four to six inches deep will make a nice blanket for those juicy worms that make our gardens so luscious in Spring. This is more about tidying and cleaning up your flower beds and not stripping them clean. Take out the dead or diseased foliage that would attract insects and rodents. Leave grasses, or cone flowers that add interest during winter and seed heads for birds. But don’t do a broad cutback of your perennials. Indiscriminate cutting might prevent some from flowering next season. It is important to let things disintegrate on their own. All perennials need to die back - so all the green (nutrient) slides back into the roots to give it strength over the winter. Cutting them back too soon can weaken the plant. Wait until Spring... takes discipline, though. I know we like to have neat and tidy gardens in Fall but resist cutting it all back. Remember that the worms that condition our soil, are sustained by decaying vegetation. Do not fertilize at the end of the season. It's rather like coffee at bed time... it perks up plants that need to be going to sleep. Like giving candy to a toddler at bedtime. Unless it is a phosphorous mix which will strengthen the roots - but do it lightly. Mulch tender perennials and roses. After putting compost on your beds, add it to any bare soil to keep it from eroding. Used around trees and perennials, it keeps moisture in and reduces run-off. Be sure to keep mulch a couple of inches from their bases though. Some use shredded cedar or pine, or layers of newspaper, then compost and then a layer of leaves. Remember that the larger the mulch (like wood chips) the less it will break down. If you have perennials in the bed, they will have to push through those large chips in order to grow. 1. The colour comes from dyes. Make sure the dye will not leach into the ground if it is not dyed with natural dyes. 2. Ask yourself: do I want folks to admire my mulch? or my garden. If you must use a colour, make sure it fits into your garden colours naturally. Fall is the best time to divide. Dividing gives you more plants and makes them healthier. When planting divisions, put compost and bone meal in the hole, fill it with water, continuing to water well and often before they freeze. This is the time to plant bulbs. Daffodils and Hyacinth, by the end of September to give them time to put down roots. Tulips, any time up till the ground freezes. Plant them at least 8 to 10 inches deep to prevent squirrels from dining on them. 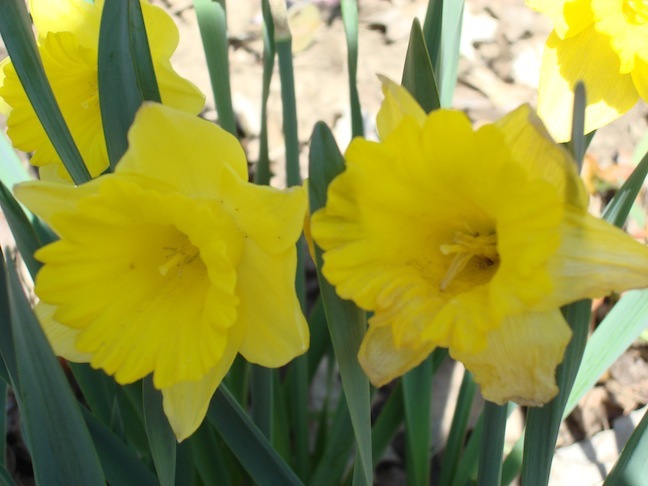 Squirrels do not like Daffodils…. I plant mine as deep as possible... 12 inches where I can - this way, I can put other plants above them, leaving them in the ground for years; this way they can spread. If you place blood meal in the hole with bulbs, the squirrels will not dig them up. Also, some swear by a product that uses chicken poop. Either one deters squirrels. If you are using powdered blood or bone meal, DO NOT BREATHE it in when you sprinkle it in the hole. Not a powder you wish in your lungs! A neat tool for making the hole, is a metal ‘screw’ for tethering dogs in the yard. It twists in easily, and pulls out straight making a perfect hole. Plant your bulbs in groups of at least 4 or 5 for the best show. Be sure to mark where they are, or when the first warm days arrive, your eagerness to start digging may unearth them. .. One last thing; don’t leave it all for one day; start now and work away at it…. Enjoy these last days, they won’t last….